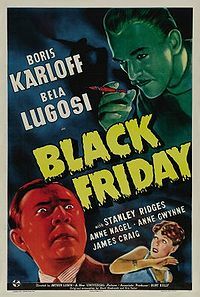 “Black Friday” is an odd film for Universal to have included in the new ‘Bela Lugosi Collection’ recently released. This is mainly due to the fact that Lugosi’s role in the film is small, blink and you will miss him. The film really belongs to Karloff. Lugosi’s character, though he gets second billing is minor in the film and on top of that, Lugosi and Karloff do not even have one scene together. Various sources have pointed out that Karloff was originally scheduled to do the dual role of Professor Kinsley and gangster Red Cannon with Lugosi as Dr. Ernst Sovac, the role eventually played by Karloff. Apparently, uncomfortable with the dual role, Karloff switched parts taking on the role of the mad scientist, a part he could play with one hand tied behind his back. Lugosi, for some reason, either chose or was regulated to the minor role of mob guy, Eric Marnay, instead of the larger and more appealing part of Kingsley/Cannon. 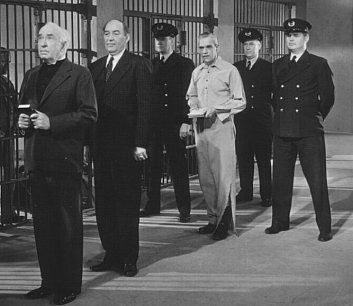 Told in flashback, we meet Dr. Ernst Sovac (Karloff) as he walks the last mile to the electric chair for the murder of his friend, the mild mannered college professor, George Kingsley (Stanley Ridges). On his way to the chair, Sovac hands over his notes to the one newspaper man who has been kind to him. From here on the film goes into the past as the story unfolds. Eric Marney and some of his boys attempt to bump off mob boss Red Cannon. Cannon’s car swirls off the road severely injuring Professor Kingsley. At the hospital, we discover Kingsley has a brain injury and the hoodlum Red Cannon a severe spinal injury. When Sovac learns that Cannon has $500,000 in stolen money hidden somewhere, he begins to think how that kind of money can be used to fund his scientific research. He performs an illegal and dangerous brain transplant, taking Cannon’s brain and replacing it inside that of his friend, the Professor. The experimental operation is a success and Kingsley soon recovers, almost. Now, I am no scientist but it seems to me that if it were even possible to do a brain transplant, the personality of the brain, no matter what body it was in, would not change, logically gangster Cannon’s brain in the Professor’s body would still act like Cannon. Well, not so fast in movie land… After the operation, the Professor seems to be just like his old self, the gentile mild mannered man he always was. Somehow, Cannon’s personality has been suppressed, at least for now. Sovac, convinced that Cannon’s brain knows the where bout’s of the half million dollars is going to force his personality to emerge. This should not be too difficult since the Professor’s brain is not there any longer to begin with! Sovac attempts to extract the information by taking the professor to New York City to haunt the places Cannon was familiar with. Amazingly, Cannon’s personality begins to surface, only he is more interested in getting even with his hoodlum associates and his former lover (Anne Nagel), than showing Sovac the money. One by one, Kingsley/Cannon is knocking off his former cronies including Marney, who suffocates in a small closet. By 1940, when this film was made Lugosi’s career had seen better days. While there was still a few good films coming (The Body Snatcher), some fair ones (Frankenstein Meets the Wolf Man) his filmography was becoming filled more and more with poverty row throwaways like “Ghost on the Loose”, “Spooks Run Wild” and “Bela Lugosi Meets a Brooklyn Gorilla” with Martin and Lewis imitators Duke Mitchell and Sammy Petrillo. Stanley Ridges in the duel role of the kindly Professor and the gangster is the real star in this film with his Jekyll/Hyde transformation smoothly done. The change in character is primarily accomplished with voice modulation and facial mannerisms than with makeup. “Black Friday” is a bit messy, totally unbelievable yet remains fun to watch. This entry was posted in 1940's, Film Reviews, Horror and tagged Anne Nagel, Arthur Lubin, Bela Lugosi, Black Friday, Boris Karloff, Stanley Ridges. I’m no scientist either, John (putting it mildly, I was hopeless at science at school!) but I suspect you’re absolutely right that “if it were even possible to do a brain transplant, the personality of the brain, no matter what body it was in, would not change.” This comment made me laugh! To be honest this movie doesn’t really sound like my kind of thing, but I thoroughly enjoyed reading your review all the same. Hi Judy, the film is illogical but with many of these films you have to leave logic at the door. 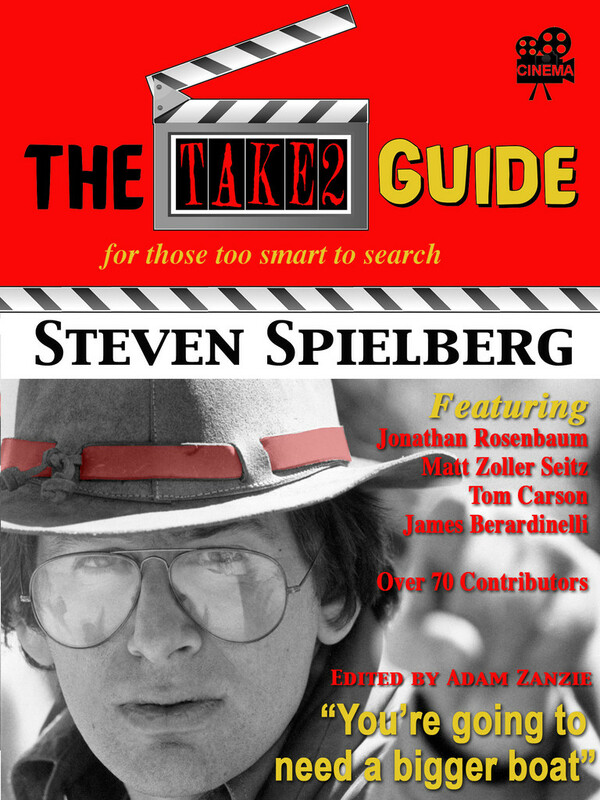 It is just a a question of how and if the filmmakers can get you to buy into it. Siodmak was probably assuming on the audience’s behalf that Kingsley retained a soul that wasn’t physically contained in his brain and was therefore still floating around inside and animating the man, yet now struggling for control with the criminal brain. That doesn’t make the scenario less ludicrous but that’s the best I can do. As for Lugosi, he may have done better work as a gangster in The Saint’s Double Trouble. Publicists made a big deal for Black Friday about Bela’s being hypnotized in order to perform the suffocation scene, and I remember that tidbit better than his actual performance. 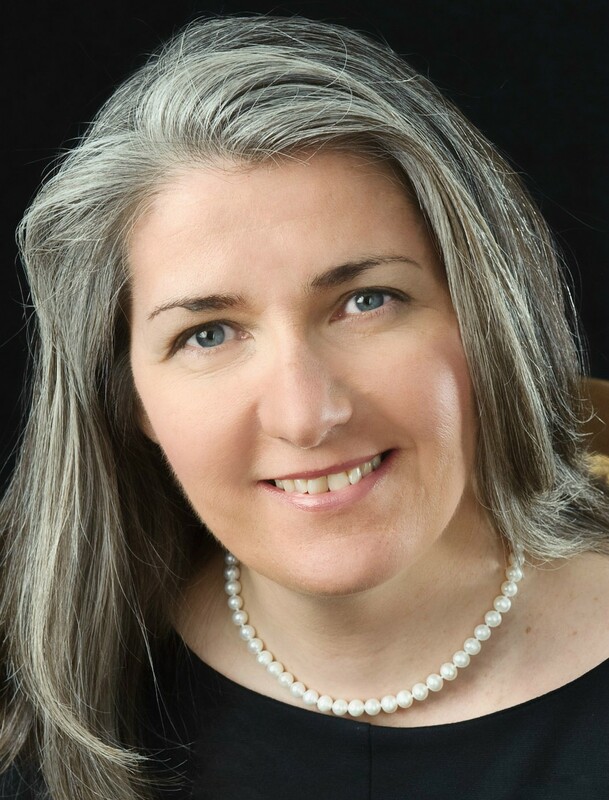 Samuel – You should write your own sci-fi story! A great thought process, at least that would have been an attempt to explain though as your say it is still ludicrous. Lugosi is just wasted here. Stanley Ridges (I agree with you) gives the best performances in this film, (in dual roles as literature professor and gangster) which on balance is the weakest film in this collection, even below THE RAVEN, which has its issues. Some would place this film in the category of science-fiction rather than horror, but I see some noir elements as well. The most important point you make in your traditionally very well-written and historically fascinating account is that from this point on Lugosi was on a downward spiral, even with that effective supporting role in Lewton’s THE BODY SNATCHER. I don’t think he ever rose again until the work for Ed Wood. (GLEN OR GLENDA remains a camp classic). But then his drug addiction took control leading to the sad conclusion. Sam – for me ‘Murders in the Rue Morgue’ was the weakest film in this set. I did not like it at all not even from a camp point of view. If I had to rate the films The Black Cat stands well above the others at the top of the list, a horror masterpiece. 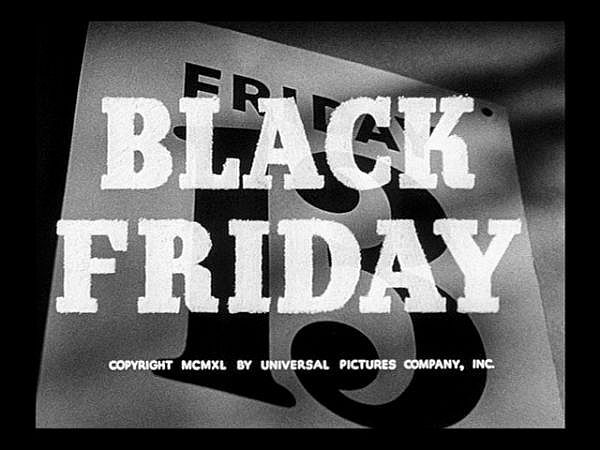 I agree with most of the above comments about “Black Firday.” However, since I am a huge fan of all of the Universal horror pics of the 1930’s and 40’s, I also did enjoy this one, even though it is not really a horror film, per say, but more of a gangster melodrama film, similar to the ones done at Warner bros. with James Cagney. This film did have quite a bit of atmosphere, as most of the Universal pics of this period had, thanks to the great camerawork by Elwood Bredell. I agree, the film does have some nice atmosphere and Bredell’s work is noteworthy. As I mention the film is an odd mix of genres but it is a fun film to watch. Thanks and please stop by again.